The worst thing that can be said about the AWM if you live in Canberra is that it is used on wet weekends by locals as a place to entertain the kids. Of which I confess to being very guilty, though a five year old son who confused his story of Jesus riding into Jerusalem with Simpson and his donkey one damp Easter provided no end of mirth. It still does. The best thing that can be said about the War Memorial is that it is not a museum first but a memorial to our veterans, living and dead. How they manage to fuse memorial and museum mystifies most and for that reason alone it is always worth a visit. With our thoughts turning to walking the Kokoda Track, on which the Japanese were first fought to a standstill, then pushed back (“Advance to the rear”, not “retreat”) the presentation of the P40 caught my eye, the diorama showing a ground crew working on the aircraft as it might have been at one of the many Papua New Guinea airstrips hastily built in the face of the impending Japanese onslaught. The aviation hall is world class – indeed the whole place is of a remarkably high standard. If you have a spare damp Canberra day up your sleeve get lost in the aviation hall at least. You won’t regret it, even it you are in the company of Canberra parents looking for some cheap daycare. 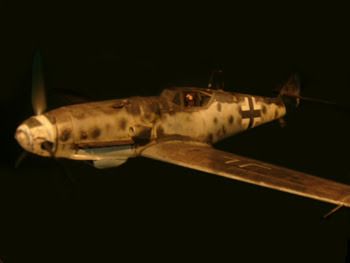 And chasing G for George (see previous post) is this Me109. Still working on those Canberra highlights!